A new week for dancers and musicians to work together, looking at how dance and music combine in the Swedish tradition. The dancers (all levels of experience welcome) will work on the elements that make up Swedish dances – posture, hold, balance, and relationship to the music – dancing with all other participants and also learning both roles in the dance (no partner required). The plan is to focus on deepening technique and approach to dance. 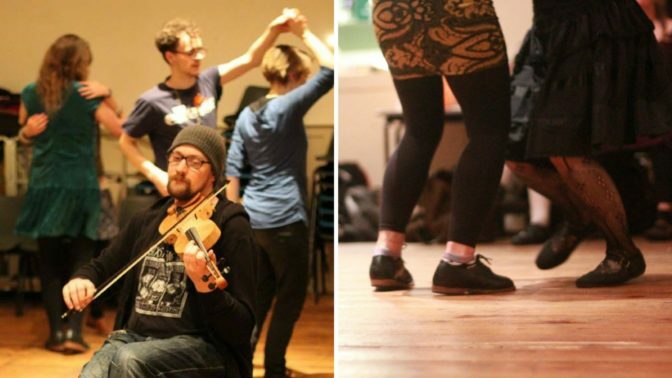 For the musicians (intermediate level and above), you’ll work in a small group to deepen your understanding of playing for Swedish dance; you’ll learn new repertoire and get to grips with different tune types to create highly danceable music. For everyone this is an opportunity to work together on the relationship between music and dance, specifically in a Swedish context, but in a way that will also be applicable to other dance styles, with musicians and dancers having the chance to discuss, learn from, and influence each other. Musicians: The course is suitable for any instrument, you should have a good command of your instrument and be used to learning tunes by ear. Dancers: Experience of Swedish/Euro dance would be beneficial, but is not a prerequisite. This course will offer everyone the chance to improve their technique, whether you are a seasoned polska dancer or a complete beginner. The course is led by members of Third Beat Dance Collective (Ella Sprung, Andrew Parr and Lucy Huzzard ). All have completed the year long folk dance diploma course at the Eric Sahlström Institute in Sweden, and teach workshops and classes around the UK. They are joined by fiddle player Albin Ekman to lead the musicians; Albin comes from Skåne in southern Sweden and is a brilliantly supportive teacher with a wealth of experience and enthusiasm.